The crossover SUV market is so…. practical. Practicality, however, is overrated; if it isn’t your main concern, I’d suggest you read on. 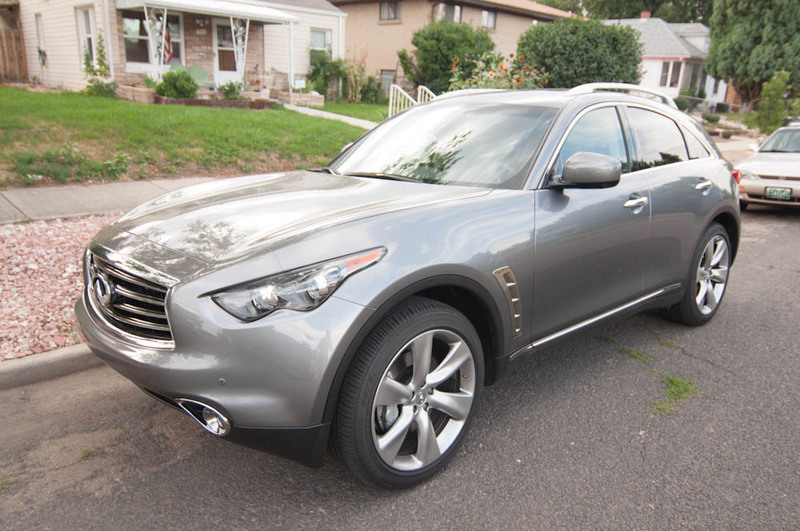 There is a lot to love with the Infiniti FX50; the car looks fresh and stands out in a crowd of conservative-looking midsize luxury SUVs. Its interior is filled with high-tech niceties and luxurious materials and finishes, and the thing likes to move. Lets start with that moving; the 5.0-liter V-8 is a wondrous thing. I could wax poetic for paragraph after paragraph but I’ll try to stick to the details. The FX50’s V-8 is fun, it quickly responds to even the slightest input from the pedal and delivers throaty, smooth speed. The FX50 delivers a whopping 390 horsepower via a 7-speed automatic transmission with adaptive shift control and manual shift mode with downshift rev matching. Intelligent All-Wheel Drive with Snow mode is standard, and although I didn’t have an opportunity to try it I’m sure it would come in handy in a month or two when heavy snow starts to fall here in Colorado. All that power does come at the expense of fuel; the FX50 gets an EPA-estimated 14/20 mpg city/highway, and premium fuel is recommended. When it comes time to stop the movement, braking via the 4 piston front and 2 piston rear calipers is confident yet composed. The midsize luxury crossover market has always struck me as a rather mundane looking group — wimpy looking SUVs or awkwardly stout looking cars. The FX50, however, for better or worse, is an original. It has a certain flair with its aerodynamic styling, aggressive looking front end and massive front wheel fairings. The FX sits on some massive 21-inch alloy wheels and has automatic bi-xenon high-intensity-discharge headlights, heated side-view mirrors, a power liftgate and a power-sliding moonroof — hardly standard SUV or crossover features. For 2012, the FX50 received many updates. The grille and front end were redesigned and the gauges’ lighting was nicely revised. Also, the Sport Package now includes adaptive headlights. The FX50 is bathed in luxury. Maple wood trims and aluminum accents decorate the interior, nicely balancing luxury, modernistic looks, and warmth. A bright center-mounted screen showcases the standard Around View Monitor, Bose audio system display, and navigation system. While the center stack may look busy it is actually rather intuitive and easy to use. The quilted leather upholstery offers a perfect balance of comfort and support for the driver and front passenger. Heated and ventilated front seats are standard and ventilation is a real blessing when the summer sun heats them up. The second row seating is slightly less comfortable. The rear seating is cramped, especially with a tall driver up front. Thus begins our stroll down the road of impracticality, especially for tall passengers who are going to have a bad time. The FX50 offers limited cargo and storage space. There are only four cup-holders available for the vehicles five-seats. Front storage space is available in a small center console and small rear armrest cubby, otherwise cabin storage is on short supply. Rear cargo space is tight at 24.8 cubic feet, you get a much more acceptable 62 cubic feet with the rear seats folded down. For comparison the Lexus RX offers 40 cubic feet. The FX50 does, however, pack in some very practical safety features. Included are standard all-wheel drive, active front head restraints, four-wheel-disc antilock brakes, an electronic stability system with traction control, and six airbags, including side curtains for both rows. You also get some standout features like the standard vehicle immobilizer system and the Around View Monitor which uses four cameras to create a side, top, front and back view of the car. A 390 horsepower all-wheel-drive luxury rocket ship on flashy 21 inch wheels. My FX50 S started at $59,350, after the addition of a Technology and Sport package and some light up kick-plates the final price came in at $66,545. It’s a luxury rocket ship made for fun and comfort, practicality; however, is not a strong point with a tight back seat and lacking storage space.